First paragraph: "I may have been a maiden just shy of seventeen years of age, but I was no simpleton. I recognized beard burn on the fair face of my sister when she emerged, breathless, from a small closet off one of the king's galleries." Description: From the acclaimed author of To Die For comes a stirring novel told that sheds new light on Elizabeth I and her court. Sandra Byrd has attracted countless fans for evoking the complexity, grandeur, and brutality of the Tudor period. In her latest tour de force, she poses the question: What happens when serving a queen may cost you your marriage—or your life? In 1565, seventeen-year-old Elin von Snakenborg leaves Sweden on a treacherous journey to England. Her fiance has fallen in love with her sister and her dowry money has been gambled away, but ahead of her lies an adventure that will take her to the dizzying heights of Tudor power. Transformed through marriage into Helena, the Marchioness of Northampton, she becomes the highest-ranking woman in Elizabeth’s circle. But in a court that is surrounded by Catholic enemies who plot the queen’s downfall, Helena is forced to choose between an unyielding monarch and the husband she’s not sure she can trust—a choice that will provoke catastrophic consequences. 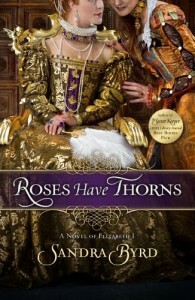 Vividly conjuring the years leading up to the beheading of Mary Queen of Scots, Roses Have Thorns is a brilliant exploration of treason, both to the realm and to the heart. 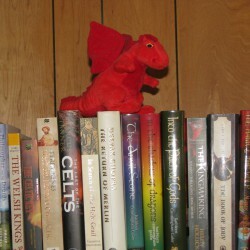 About the author: Best-selling author Sandra Byrd has published nearly three dozen fiction and nonfiction books including her new Tudor-set series, Ladies in Waiting. Book 1, To Die For: A Novel of Anne Boleyn launched in 2011. Book 2, The Secret Keeper: A Novel of Kateryn Parr will debut in June, 2012. Her other titles include the French Twist series, which includes the Christy finalist Let Them Eat Cake (2007) and its sequels, Bon Appétit (2008) an Piece de Resistance (2009) as well as the London Confidential series for tweens. For nearly a decade Sandra has shared her secrets with the writing students she mentors and coaches. Before turning to full-time writing, Sandra was an acquisitions editor. She lives in the Seattle, Washington, area with her husband, two children, and little dog.